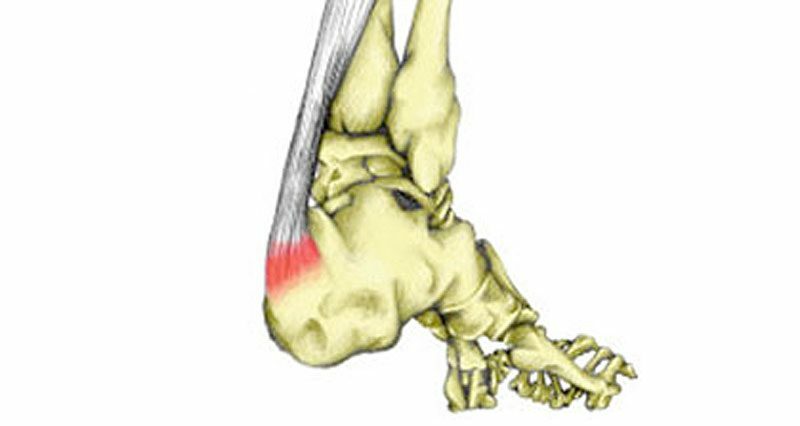 Insertional Achilles Tendonitis causes pain at the back of the heel at the point where the Achilles tendon inserts into the heel bone. The injury is similar to Sever’s disease in children, usually occurring gradually, but can also be acute or sudden onset. If it is acute, the main aim is to prevent the injury from becoming chronic. Here we explain the symptoms, causes, and treatment. Symptoms consist of pain at the back of the heel, in particular when pressing in at the point where the Achilles tendon inserts into the heel bone (calcaneus). The pain can feel sharp or more of a dull ache. There may be redness or swelling present. A lump may also be visible at the back of the heel, especially in more chronic or long-term cases. The Achilles tendon is the large tendon at the back of the ankle, which connects the strong calf muscles to the foot. Huge forces are produced through the Achilles tendon, which can often lead to overuse type injuries, especially in athletes. The tendon is encased in a sheath and space in-between, this is called the Paratenon, which becomes inflamed when there is insertional Achilles tendonitis, especially where it attaches into the calcaneus (heel bone). Acute insertional tendonitis can be caused by repeated friction of the area. Irritation and inflammation at the point where the tendon inserts into the bone are called apophysitis. It is more common in growing children and adolescents and is known as Sever’s disease. Adults can also get the issue from activity such as running or jumping. The tendon insertion becomes inflamed and may sometimes cause an avulsion injury, where the tendon tears, pulling a small piece of bone away with it. 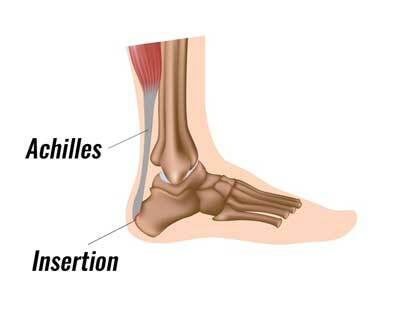 Chronic insertional Achilles tendonitis in teens is usually due to an issue like sever’s disease where traction forces pull the tendon away from the bone at the site of insertion. This is due to growth where the tendon or muscles become tight and can be painful on activity or touch. This condition can leave a lump on the heel if chronic but was to help to take tension off the Achilles tendon. Read more on Sever’s disease. Exercises and treatments are similar to those of Achilles tendonitis. The most important intervention for insertional Achilles tendonitis is in the acute phase to stop a chronic issue and is usually treated by reducing the inflammation with rest, ice, stopping the irritation or loading issue, gentle stretches, NSAIDs (non-steroidal anti-inflammatory drugs), isometric or eccentric exercises and it is important to not poke or rub the area. In chronic and acute Achilles tendonitis reducing or rescheduling the load to stop overuse is essential. Also making sure the calf muscle can take any load and endurance of the activity with full mobility and tonicity of the muscle group when required, will both help treat but also stop insertional Achilles Tendonitis from occurring.